While Lightroom doesn’t have any functionality for keeping your photo library backed up, it does have an excellent mechanism for regularly and automatically creating a backup copy of your catalog. After all, the Lightroom catalog is where all the work you do inside of Lightroom is stored, so why wouldn’t you want it backed up? Over the years I’ve heard from a few people who avoid the built-in catalog backup function because they already regularly backup the drive their working catalog is on, or because they have Lightroom configured to write changes to each photo’s XMP metadata (or both). I don’t have any quarrel with either of those options, but there are a few points to consider. First, when you run Lightroom’s catalog backup function you have the option to make it do an integrity check on your catalog and then optimize it (do some database housekeeping) as part of the process. That might be just the early warning you’d be happy to get if there was a problem forming in your working catalog. If you only ever just backed up your working catalog you could potentially be backing up a failing catalog and not know it until it was too late, and then find out that same problem exists in your backup too. Benefits of having Lightroom backup the catalog. Second, if you configure Lightroom to automatically write changes to your photo’s own XMP metadata (which is an article in itself for another time) then you have to also keep in mind that Lightroom cannot write every bit of data that is stored in the catalog to XMP. Regular collection membership, flags, virtual copies, and all of the individual steps in the History panel cannot be written to XMP and only exist in the catalog. If you can live without those things, and you certainly can, then no problem, but I just don’t want you to find out the hard way. If you like wearing a belt and suspenders, then there is no harm in having Lightroom automatically write changes to XMP and backing up your catalog too. Now that you understand what is at stake, here’s how to enable this catalog backup feature and sleep a little easier at night. Go to (Mac) Lightroom > Catalog Settings > General / (Win) Edit > Catalog Settings > General, and choose a schedule that suits your workflow. I like to use the Every time Lightroom exits setting so that it constantly reminds me when I finish a work session. I can always choose to skip, and I do when I am in a hurry, but I appreciate the nag. Trust me, when it comes to falling back on a backup copy you want it to be as recent as possible, so choose a frequency that you can live with and try to do it at least once a week. Just remember to take Scott’s advice and delete those old backups periodically. 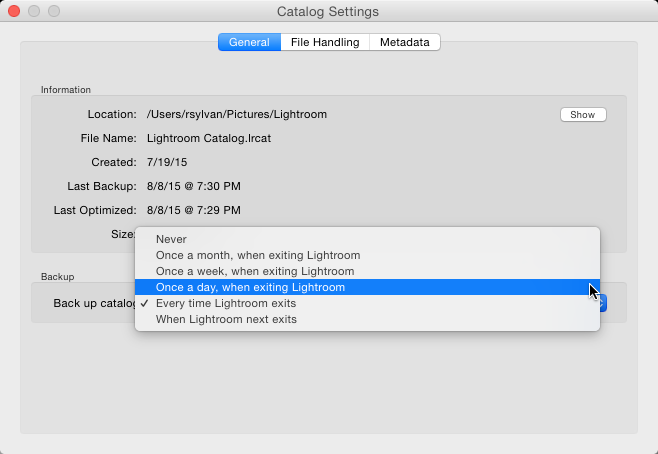 The next time you exit Lightroom on that schedule you’ll be prompted to run the backup. It is in only in this dialog box that you can choose where you want this backup copy to be created (refer back to the first figure). I suggest directing it to be saved on a different drive than your working catalog is stored to protect from disk failure, but if you only have one drive then you might choose a folder that is synced to some kind of cloud storage (I use Dropbox), so that the catalog copy is duplicated in another location. From here on out it is automatic, so just don’t skip too often. Find all of my 10 More Things posts. Very helpful and informative, Rob. Your writing style makes the material very accessible to those with less-than-deep technical knowledge. Looking forward to more! Hy Rob, great article ! I’ve got a question for you : I back up lightroom catalog in an external hard drive, but how can I choose where to save the main catalog ? It actually is located in the same hard disk with the back up ( I don’t really remember how I managed to move it there !! ) but I want it to go back to the computer hard drive. Just move the catalog from one disk to another, open lightroom, the open the catalog from the new location. I’m sure you didn’t move it there. My guess is that it was due to that Default Catalog setting I covered in yesterday’s tip (that is why I made it the Number 1 tip), so go back and make sure you change that setting. To move your catalog back to your main drive, I’d start by going to your Pictures/Lightroom folder and my guess is you are going to see an old catalog (and associated preview cache) from right before that Default Catalog setting shunted you over to your backup folder. That one is most likely out of date and no longer useful (you’ll have to figure that out), so I would move all of those files out of that folder and put them in a safe place for later (or just delete them and move on). Then, with Lightroom closed, use your file browser of choice to *copy* your actual working catalog (and its associated preview caches) from the backup location to the Pictures/Lightroom folder. Once the copy operation is complete, double-click the catalog file to open it into Lightroom and verify all is well. Then go back to my first tip and make sure your Default Catalog setting is set correctly so that this doesn’t happen again. Rob ! Thankyou soooooo much ! I can’t explain how useful you suggestion has been ! Everything works fine now and I’m really happy. If I could change something, though, I would love for Adobe to also have a “return to editing” button on the shut-down dialog. I confess that to speed up the backup I occasionally used to delete all my history steps for images I knew I will not re-edit or that had eventually gone through PS. The first time I did this my backup went from 3Gb to 750Mb which is a substantial saver, but not as good as the zipped version which is even smaller.Adobe have made lots of really valuable changes in recent years, even the import “create a second copy” has improved to an easy form where, when restoring the database from a backup, the missing recent files can easily be identified and re-imported. You are not alone in wishing there was a cancel or return to editing button on the catalog backup dialog. Or perhaps if there was a way to manually run a backup without shutting down. If you use Crashplan or Apple’s Time Machine with the Lightroom folder, is it really necessary to perform catalog backups? They take up a ton of space since it doesn’t automatically purge the old ones. I do think the benefits of running the automated backup outweigh the periodic task of deleting the old ones.